Roots Pots by Aurora Innovations are degradable and are designed to work 3 to 5 years. These pots utilize a recycled fabric which is different than the other fabric pots brands we offer. 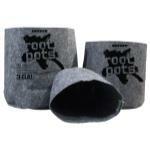 Root Pots are ECO-friendly and are designed to break down after multiple season if use. Like other grow bags these can used both traditionally outdoors or indoors on hydroponic flood tables. Available only in the gray/black color but come in wide range of sizes.